Christine Butler, M.A. is a professional counselor who serves as a member of the Calvary staff. Christine received her BA (Psychology) in 1996 and MA (Counseling) in 2003 from Indiana University of Pennsylvania (IUP) and has worked in the community as a Counselor at the Indiana County Guidance Center, Alice Paul House, as a temporary Group Facilitator at the Open Door and most recently as a Sexual Assault and Domestic Violence Counselor at the Counseling Center at IUP. She is a member of the American Counseling Association. Her approach to counseling includes various methods supported through research. A more complete account of her experience and style will be made available at any Intake Interview or more fully explained upon inquiry. Below are answers to frequently asked questions about Calvary’s counseling ministry. What is meant by a counseling ministry? Mental health counselors assist people with lifestyle changes that will improve their overall mental health. Many issues are existential and spiritual in nature but often these are not discussed in traditional counseling settings. 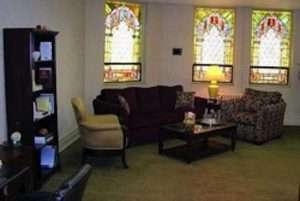 A counseling ministry offers a setting in which the counselor can help the counselee address religion and the ways in which it informs their lives and values if a desire to do so is indicated by the client.This does not take precedence over or substitute for the caring ministry of the pastor or compassionate care of church workers or fellow church members but will extend or complement those services for individuals who may need to address more complex mental health issues. Why make a counseling ministry available? This type of faith-based service is greatly needed within the Indiana Community. Calvary is excited about offering this resource to the larger community in a spirit of mission and outreach and now includes counseling as an integral part of its staffing and programming. A goal of this ministry is to honor and respect others’ religious beliefs and principles, taking care not to impose any particular value system but rather to encourage people to explore their own. Also, in the spirit of outreach, workshops will be offered from time to time. What about confidentiality: who will know who is being counseled? Confidentiality will be strictly followed which is required by the ethical guidelines of the counseling profession and the American Counseling Association of which Christine is a member. If a person wants the counselor to consult with anyone, a form of consent will be offered, signed and discussed beforehand. Clients may self refer or be referred by their clergy or any other professional or friend. This will be a fee-for-service ministry. Each session will be paid for as per agreement between the counselor and counselee. Call for fee information. No insurance is accepted. How do I enlist services? To make an appointment call Christine Butler directly at 724-541-4857. Where are the counseling sessions held? Church, 695 School Street in Indiana.